Gun industry groups tell court microstamping goal ‘impossible’ to meet 9/05/17| by Chris Eger - 1776 Supply Co. In the latest salvo fired by two firearms industry groups against California’s microstamping mandate the groups maintain the state wants something that just isn’t available. The National Shooting Sports Foundation and Sporting Arms and Ammunition Manufacturers’ Institute argued to the California Supreme Court in a filing last month that the state’s 2007 law requiring new semi-auto handguns sold in the state to have the capability to permanently mark shell casings fired through the gun with an identifying mark asks for something that cannot be done. As such, the state has whittled down the number of pistols certified for sale to the point that the industry has lost $183 million annually since 2013 in missed sales to California’s gun owners. The groups point to the fact that the roster of approved handguns as of late July contained just 504 models of semi-auto pistols, compared to 867 in early 2014 when they first filed suit against the provision of the state’s Unsafe Handgun Act. 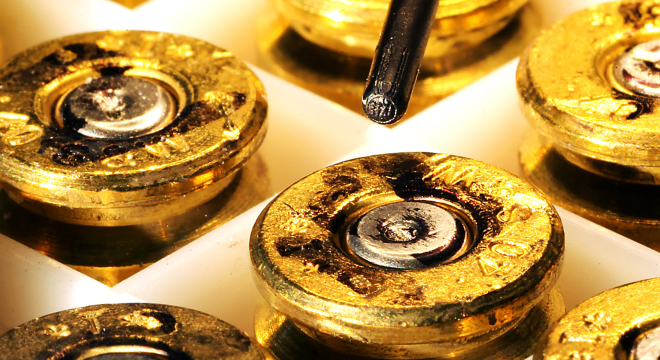 As old designs are decertified, and no new ones are approved as they lack the capability to stamp their ejected shell casings, the roster contracts. Manufacturers such as Smith & Wesson have publicly stated they will not include microstamping in their firearms. The trade groups do not fault lawmakers for their desire to reduce crime but argue the microstamping rule is unfair, unworkable and has the effect of limiting Second Amendment rights. “It is not the wisdom of the legislative goal, but rather the impossible method the Legislature has chosen to achieve that goal, that lies at the heart of this case,” the filing says. California Superior Court Judge Donald Black dismissed the case in 2015. In his ruling, Black cited the doctrine of sovereign immunity precluded the argument of the gun industry groups that “the law never requires impossibilities,” and felt the groups lacked standing to sue. On a subsequent appeal to the California 5th Appellate District, a three-judge panel found last December that NSSF and SAAMI have “a right to present evidence to prove their claim” and this March the state’s Supreme Court voted 6-0 to review the matter.